Schefflera plant also goes by the name Umbrella Tree. This tropical plant has been a common house plant a long time, and it's easy to see why. It makes a beautiful accent for any brightly lit room. Its upright branching stems bear horizontal spoke-like leaves that consist of about 8 large, dark-green leaflets. A dwarf variety (Schefflera arboricola) is a much smaller and bushier plant. 'Variegata' (shown at left) is a variegated form with green and yellow leaves. Pruning schefflera may be necessary on large varieties. As the plant ages, it loses its lower leaves, becoming leggy. Prune it back harshly to stimulate new growth and to keep it full. Pinching off the growing tips will promote branching. Schefflera plant care is easy. Put it in a bright spot, out of direct sun and place the container on a saucer of wet pebbles to increase the humidity around it. Dropped leaves? Schefflera doesn't like to be moved around and may drop its leaves if exposed to cold drafts or blasts of hot air from heating vents. Repot in spring when roots grow through the drainage holes in the bottom of the pot. Use a heavy pot to prevent toppling -- this plant can get top-heavy. Pests are few, however spider mites may invade if the air is dry. Keep an eye out for webbing between stems and the undersides of leaves. Raising the humidity around the plant in winter will help to prevent an invasion. Buying a new schefflera? Choose a plant based on the size and type you want. They're all easy to grow. With good care, this beautiful, tropical house plant will live for several years. Height: Up to 6 ft (1.8 m). Tall Schefflera actinophylla plants will need support. Mature plants have aerial roots that can be trained to cling to a moss stick. Light: Bright light, no direct sun. Turn plant occasionally in front of the window to encourage even growth. Water: Water thoroughly to get all the roots wet. Allow the top inch of soil to dry out between waterings. Yellow leaves are a sign of overwatering. Drooping leaves usually indicate that the soil is too dry. Humidity: Average indoor humidity (about 40-50% relative humidity). If your home gets too dry in the winter, use a room humidifier or mist with water. 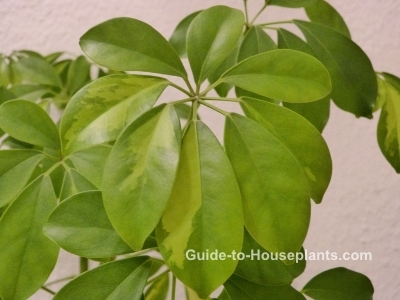 Temperature: Average to warm room temperatures 65-75°F/18-24°C; schefflera will tolerate a minimum of 45°F/7°C. Soil: Peat moss-based potting mix. Fertilizer: Feed monthly with a balanced liquid fertilizer diluted by half. Propagation: Take stem tip cuttings in spring and summer. Can be grown from seeds.